If I had to use one word to describe my experience with NaNoWriMo this year, I think it would be frenzied. 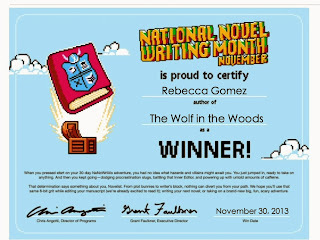 I have participated in National Novel Writing Month several times in the past. And every time I participated I had some measure of success, meaning I wrote. A lot. One of those projects became a finished novel-in-verse which is now in the hands of my lovely agent. But I had never crossed that threshold of 50,000 words. Never even really came close. This year, however, I had more time to dedicate to my writing. And, perhaps even more significant, I was determined. I had a bit of a rocky start, with November beginning on a weekend, and that weekend being one filled with dinners with family and friends. After that first weekend, I made fairly steady progress, writing furiously for hours at a time. Much like the art journal I began back in January, this year's NaNoWriMo project was an exercise in letting go. I let the words flow. I didn't question (much) what words came out. Whenever my internal editor crept up beside me, I slapped her silly and left her crying in a corner! If I felt stuck, I skipped ahead. Other times I would write some of my thoughts as dialogue between two characters while I tried to figure out what was going to happen next. Whatever. As long as I kept writing! By November 20th I had two journals full of story! I had reached the "end," but I was far from finished. I still had at least 16,000 words worth of holes to fill in. I slowed down a bit at this point, because filling in the holes in my novel required a little more thought than everything I had written before. I had relationships to develop, plot holes to fill in, and settings to enrich. Still, my word count was growing a little bit every day. Then...Thanksgiving came. And I had an out of town guest. And my word count hovered in the neighborhood of 41,000 words for about three days. When my out of town guest left on Saturday morning, November 30, the LAST DAY of November, my word count was at 41,736. I had a little over twelve hours to write a little over 8,000 words. Wow. Holy buckets. Oh snap. Could I do this? Of course I could. Like I said, I was determined! I wrote and wrote and wrote. As Saturday evening came around, I felt like a racehorse, gradually gaining on all the other horses in the final stretch. I was closing in, and I was going to win by a nose! And I did! At 11:45 p.m. on November 30, I crossed the finish line with 50,033 words. And did my hubby even congratulate me? No, he said, "Thank God it's over!" I can't blame him. 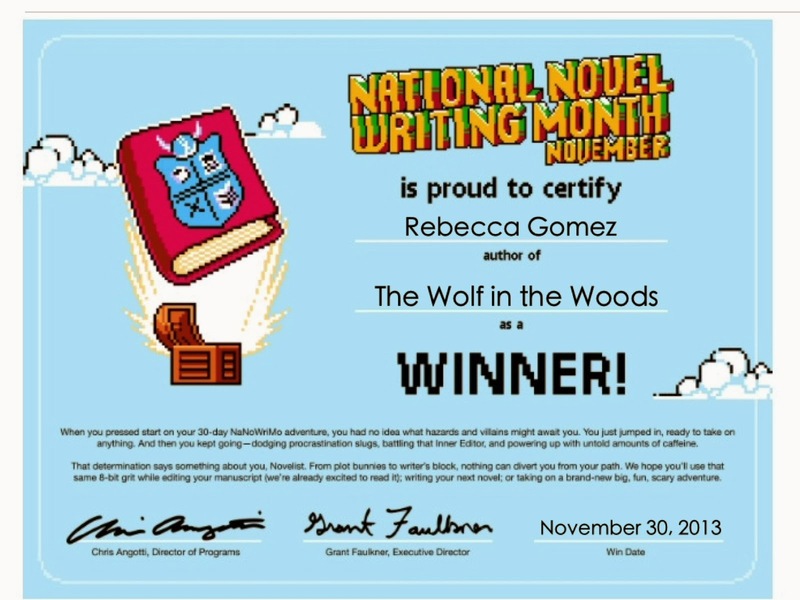 As awesome as it was, I'm glad the NaNoWriMo frenzy is over too!